Michael McFadyen's Scuba Diving - Osborne Shoals East Drift Located directly off Cronulla Beach, Osborne Shoals is one part of the reef that can be found intermittently from Kurnell to Bundeena across Bate Bay. Like Merries Reef further to the north, the top of the shoals is generally flat and covered in kelp, although some parts are covered with sponges. Once you drop off the top, however, things change. On the eastern, northern and southern sides a sharp drop off takes place with the depth going from 12 to 20 or more metres in some spots. These are the best sections. There are dives like Osborne Shoals, Osborne Shoals East and more. One dive you can do here is a drift dive along the northern and eastern side. You need calm seas and little wind to do this dive as well (obviously) someone to follow you in the boat. 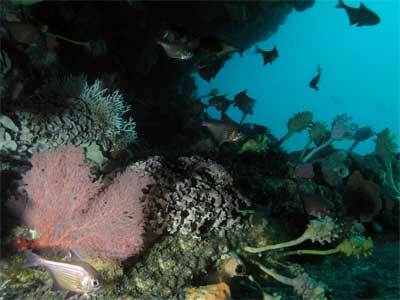 Winter is the best time to do this dive, with westerly winds and flat seas. From Port Hacking, head out to the north-east once you pass Oak Park to GPS Marks of 34° 03' 35"S 151° 11' 12"E. Note that all the GPS Readings on my Web Site are taken using AUS66 as the map datum. If you use another datum you may be about 220 metres off the wreck. See my GPS Page for more details and how to convert readings. This will place you on or near the start of the dive. The marks for finding the reef (shown at left) are described as follows. The western mark is found by lining up on the middle of The Kingsway at Cronulla. The northern mark is found by lining up the sewerage outlet breather pipes at Potter Point with the dune ridge to the immediate left of Cape Baily Lighthouse. Once you have your divers ready to enter the water, in a north-easterly breeze, run in over the shoals from a southerly direction. As soon as the depth sounder shows a drop in depth from about 12 metres to 18 metres, the divers can enter the water. This should place you over the northern-most part of the reef adjacent to the cave. In a southerly breeze, work into the wind and drop you divers just as you go over the wall. After descending to the bottom, if you are not already on the reef edge, swim to the north. Head to your right as you reach the sand which is about 18 metres deep. Keeping the shoals on your right-hand, swim to the east. If you have been dropped on target, you will see a large cave after only a few metres. If you are too far to the west you will go over some large rocks located just off the reef. Just past here is the cave. 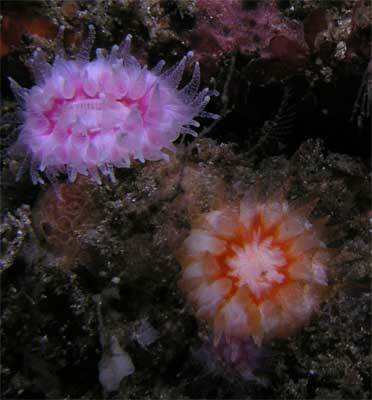 Swim into the cave and examine the roof, sides and floor and you will notice some very interesting gorgonias, jewel anemones, sponges and sea squirts. This is also known by some as Meditation Cave. This name came from a member of the St George Scuba Club who used to enter this cave and just relax and meditate whenever he dived here. You can see why he might have done this when you look at the beautiful colours. When you come back out onto the sand, it is about 20 to 21 metres deep. Continue to the east past a small overhang on the corner as the reef turns to the south. Even more marine life can be found on the walls of the reef in this area. Ahead there is a small "inlet" and a crack that leads over the reef to the south. The sand here is home to the very strange looking serpent eels. If you do not disturb the area, you might be able to see their heads sticking up out of the sand. To the left there are some large boulders and then a sandy patch. Past here there are more rocks. There are some overhangs here that have cuttlefish and octopus living in them. I have even seen a huge octopus guarding her eggs. This is where most divers on the normal Osborne Shoals dive will have to turn around so once you get past here you willl be in new territory. The rocks run out about 20 to 30 metres from the main wall here. The reef goes further to the east but then it turns to the south. The depth will increase to about 24 metres. The wall here is about two or three metres and there are some small rocks off the wall. There are a few small overhangs along the wall. This section of reef has come very nice sea squirts, sponges and small gorgonias. The main wall eventually turns to the west (a lower part of the reef continues south) and the depth increases to about 25 metres just before this. Eventually you have to surface due to running out of bottom time. This will be about after 35 minutes. The visibility here is usually quite good, with 9 to 12 metres being average. In March 2001 I had in excess of 25 metres and in August 2005 over 15 metres. Sea-tamer II visits Osborne Shoals. You can contact them at their web site for info on trips.